So there I was with a friend in the TMobile store, not defending Verizon, but arguing with the sales person about how TMobile's rent a phone program is no better than Verizon's two year contract program. As he was touting all of TMobile’s virtues and explaining why it was costing my friend $175 with her insurance to replace a Galaxy S4, he stated how much greater TMobile's speeds were. He did a speed test, which he showed me on his phone, and his speed was 17 mbs. Now look at my speeds (the three at the top of the list) and that was after restarting my phone because I wasn’t even in 4g. We were not in a mall, but in a strip center. We left there and went to a corner restaurant where I stopped trying to search online because of this ridiculous speed. P.S. Look at my Cox speed at the bottom. $55 a month for all that! Also, the TMobile dude tried to match my bill with my five lines and 6 GB data. He quoted me $10 a month less. It was really funny when I told him I did not want a rent a phone. He looked insulted and questioned the use of the term rent a phone. Well, when you pay $300 for the use of a phone for a year and then turn it in for another, it is a rent a phone. The Edge is no better, in fact worse, because you have to pay 21 months worth before you can hand over your phone just to get to upgrade three months earlier. I remember when Verizon just let you upgrade after 20 months AND keep your old phone. I actually remember when Verizon let you upgrade after one year, and keep your old phone. Oh ... and the reason the insurance deductible is so much higher at TMobile is because TMobile's program is more like a "club." What? Lol! A club? He said, yes, we can help you find your phone if you lose it. Really?? Isn't that something!? I told him how I found a pinging phone that had been on a four lane road overnight, through Google locations. Sales people really don't want to argue with me about phones. I already know. Tmo will always kick the snot out of LTE if you are really close to a tower. If not, Tmo has femto cells which repeat cell signals through your internet service. You can bet they have one in the back room hooked up to a fiber line. Now, go back to that store, take your Verizon phone about 6 miles outside the city limits and re compare. While your maxx is happily downloading in Mbps rates, the Tmo will be happily wishing it could find a signal. I have faced the same thing. Tmo worked great in Wichita, even better than Sprint or Verizon. A tad cheaper too. But by the time I made it out of town on my way home to Hutchinson, it would struggle to find enough speed to send texts reliably. 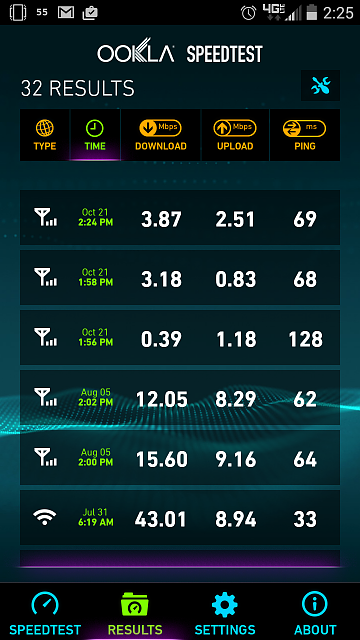 The 4g speeds of Verizon have really decreased over the past year or two. I remember getting super fast 40-plus mbs speeds. Now I am lucky to crack 15. 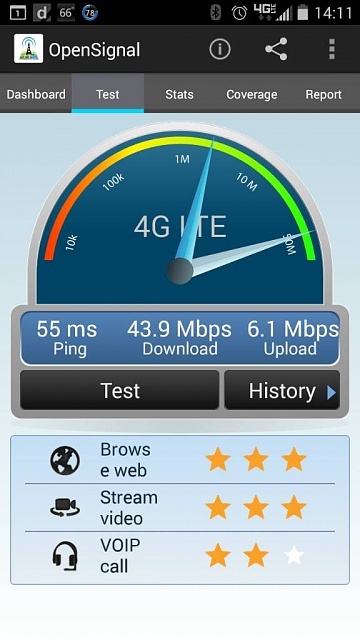 When I'm in the new band 4 markets I get great LTE bandwidth. But, who cares? I use my phone mostly for email, reading web articles, catching up on news, and, yes, texting and making phone calls. A few extra mbps aren't going to make much of a difference for me. T-Mobile is more than welcome to come to my house to have that test. I have to walk up or down the road about a quarter mile to get a T-Mo signal at my house. That's why I stay with Verizon - I am most likely to have a signal where I find myself than I am with any other carrier. And, honestly, I've had no billing problems, decent customer support, a few idiotic sales reps who know less about phones than I do (but I'm sure that's the same at all of the carrier stores), but, overall, nothing but great service when I've needed it. If T-Mobile spent the money to extend their network to the places I live and love to go, then I'll be happy to consider them. I seriously had trouble browsing the web yesterday at that shopping strip. It was bad. I guess I must be in a good area then. Silverback, I hope you see my reply. I've been having 4g problems with my Note 4. My 4g is not good and I drop down a lot to 3g and even 1x. I will provide the link to my thread regarding this issue in the event anyone wants to read about the problem, but I thought about you because when I got into the Verizon store my 4g service was p-e-r-f-e-c-t. I asked the rep about the boosted antenna in the store and yep, he had to admit the service in the store is boosted. What read/write speed of a microSD card should I get for the Tab S? anyone with udp pre order the n4 and keep udp? Is the M8 GPE Rom the real thing? How do I remove the error message from my Google Location Service?